Sell your DIRGE items on eBay ! This is my favorite Post Metal release of 2007 so far ... it's very diverse, there's a lot of noise, feedback and droning sounds but also melody and traces of "conventional" song structures. Vocals are "typically" Post Metal, but quite accessible and they match the music perfectly. Both musicianship and production leave very little to be desired, and even considering that this album clocks in at 120 minutes and the last track alone is 60 minutes long it never gets boring for me ... they never draw out a part for too long and there's always something new coming up. Meridians (19:24): This track starts in a "typical" Post Metal style (Isis), but after 6 minutes it all dies down and morphs into layers of delayed/distorted feedback and industrial noise accompanied by sparse drumming. By the 10 minute mark it all fades down until only a vague guitar line is left, only to make way for an ultra heavy doom metal riff (12:30), again accompanied by industrial noise. This chugs on for the rest of the track, with genre-typical vocals and occasional effects-ladden guitar solos (not very flashy though). End Infinite (2:45): A very cool interlude, dominated by a droning/shifting bass note and acoustic guitars with a short outburst of drums/distorted guitars in the middle. Epicentre (14:39): This starts very silent, only a few guitars playing minimalistic riffs/licks over a brooding industrial ambiance (almost sounds like static in an engine hall). Then the drums kick in, playing a slow, tribal rhythm accompanying a sad melody. This goes on for a few minutes and is then repeated in a more heavy style. From 6:00 on a really cool doom riff dominated phase begins, again with cool guitar lines (like in the second phase of the first track). Only at 11:00 vocals join in ... and they blend perfectly with the music. Lotus Continent (16:48): There's a lot of distorted noise at the beginning, juxtaposed with sad melodic leads and accompanied by minimalistic drumming and guitars.This makes way soon for a quite diverse mix of styles which are similar to those used in all the previous tracks, but generally a bit more melodic. Nulle Part (7:51): This track is the only one on the album which features female narration and clean male vocals. It's very spacey and atmospheric and distorted elements are quite reduced, making this one sound much more melodic than the other tracks. The track makes extreme use of layered synths and single guitar notes, creating a thick wall of sound with the drums merely providing a slow constant "pulse" (deep toms). Wings of Lead Over Dormant Seas (1:00:00): This is quite a monster of a track ... clocking in at exactly 60 minutes. It starts with an ambiance which to me seems like a mixture of a submarine (with echoing sounds resembling sonar pings) and a cave (with water dropping from the ceiling). Then some narrating kicks in which is later joined by melodic lines of guitar and cello. Every now and then faint, high-pitched swirling sounds can be heard, and the drums play a slow/minimalistic but quirky ("stumbling") pattern of bass drum and snare. Then at the 7 minute mark the bass kicks in ... and the guitar plays a clear motif. Vocals join in ... in a raspy style previously not used on the album. It builds up nicely towards the 13 minute mark and then morphs into a dark synth/industrial noise part. This one develops slowly, with swirly/chopper-like sounds ... actually it sounds very much like flying with "Wings of Lead over Dormant Seas". This phase extends well past the 25 minute mark when slowly the riffs get more melodic. Suddenly a trumpet emerges and plays a motif accompanied by a banjo-like guitar, and the accompanying layers "soften" up quite a bit, distorted guitars make way for piano and synths. Darkness is still there though, submerged like distant thunder. Then at 31:00 doom metal returns with a majestic riff while the trumpet continues in the background. At 37:00 that phase ends, still the trumpet continues on top of a brooding ambiance which seems like some residue of the former heaviness. Finally at 44:00 vocals re-enter the scene, in a similar style as before ... providing a feeling of closure. Then finally - during the last 10 minutes - the whole structure dies down, until a last piece of narration closes the track. A violently beautiful effort by a very talented band. 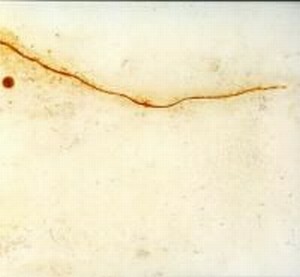 Wing Of Lead Over Dormant Seas is a haunting listen to say the least. Although it drags on perhaps a bit too long (two hours) every note in the album is filled with raw beauty that floods the listeners senses like some kind of mechanical liquid beast. The great mix between the gentle nature-like sound of post rock and the mechanical and dark post- metal really give the album it's enticing effect and it is one to enjoy. Every track is at least somewhat strong (which is a hard thing to do in two hours time) and the only true flaw is definitely the length of the album. I'm not usually one to complain about such silly things but if the disks were released seperately I think it would have been a lot more effective. A wonderful album nonetheless, if you love obscure post-metal or just want to try something great this album is for you. 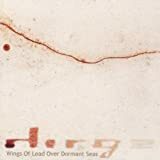 Post a review of DIRGE "Wings of Lead Over Dormant Seas"